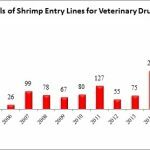 For the month of September, the U.S. Food and Drug Administration (FDA) reports that 4 out of the 66 (6.1%) total seafood entry line refusals were of shrimp for reasons related to banned antibiotics. 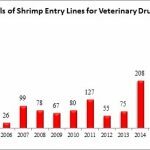 Old Medan BMSfood (Indonesia), a company that is not currently listed on Import Alert 16-124 (“Detention Without Physical Examination of Aquaculture Seafood Products Due to Unapproved Drugs”), Import Alert 16-127 (“Detention Without Physical Examination of Crustaceans Due to Chloramphenicol”), or Import Alert 16-129 (“Detention Without Physical Examination of Seafood Products Due to Nitrofurans”), had one entry line refused for shrimp contaminated with nitrofurans and veterinary drug residues by the Division of Southwest Imports on August 28, 2018. 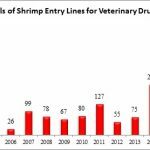 The entry line refusal of shrimp from Indonesia for banned antibiotics in August marked the first time that the FDA has refused shrimp from that country for the presence of veterinary drug residues since August 2015. The FDA had initially reported four entry line refusals of shrimp from Indonesia in January of this year, but later removed those reported refusals from its online database.